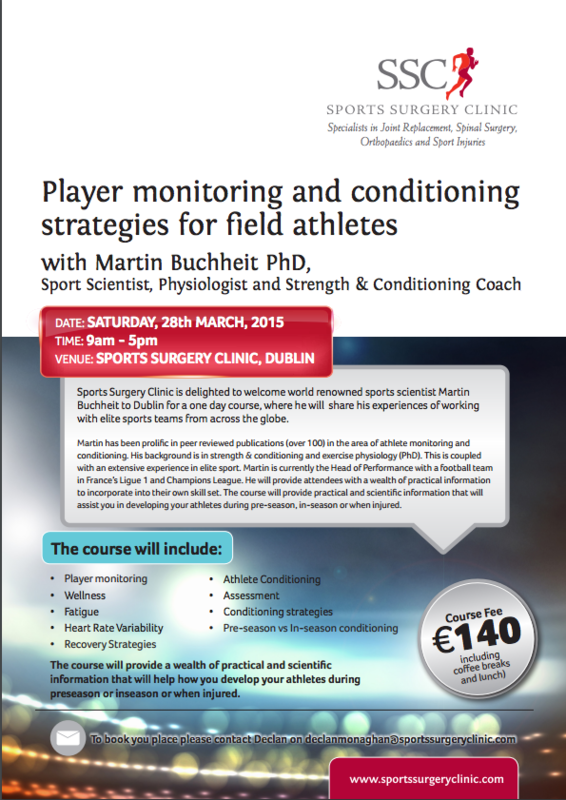 Sports Surgery Clinic is delighted to welcome world renowned sports scientist Martin Buchheit to Dublin for a one day course, where he will share his experiences of working with elite sports teams from across the globe. Martin has been prolific in peer reviewed publications (over 100) in the area of athlete monitoring and conditioning. His background is in strength & conditioning and exercise physiology (PhD). This is coupled with an extensive experience in elite sport. Martin is currently the Head of Performance with a football team in France’s Ligue 1 and Champions League. He will provide attendees with a wealth of practical information to incorporate into their own skill set. The course will provide practical and scientific information that will assist you in developing your athletes during pre-season, in-season or when injured.